This is my view right now. 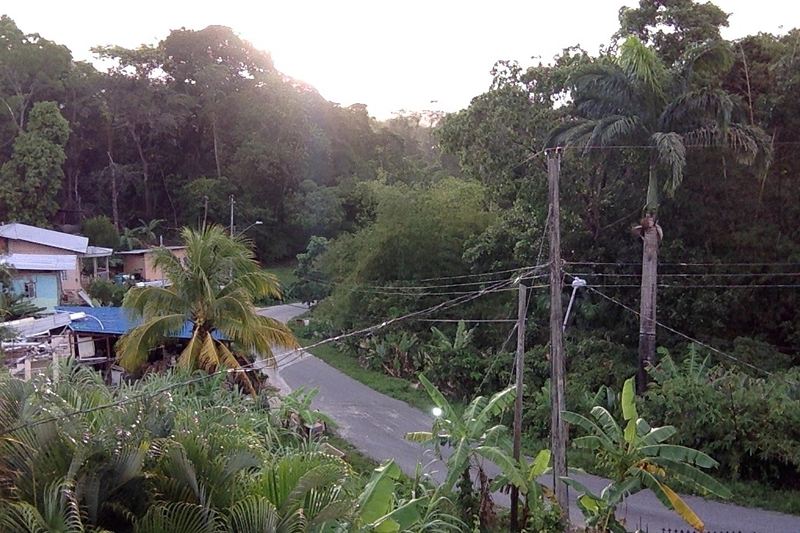 It is early evening, there is a rooster crowing, there are birds chirping (somewhere there are parrots! ), and I can’t wait for the sun to set. We are at Matura in Trinidad. I’m here with Devan, our CSTN turtle technician, and Canadian sea turtle expert Dr. Mike James. A film crew from NHK Enterprises in Japan is working on a leatherback turtle documentary. They have invited the CSTN to be part of it, and the first segment they are filming takes place here. We were delighted to have the chance to come back to Trinidad. Mike and Devan were here last year with the wonderful film crew who made the Nature of Things documentary. I haven’t been here since March of 1998. This is the beach where Dr. Scott Eckert first trained Mike and me to satellite tag leatherbacks. Scott is here, as are our friends from the Nature Seekers. 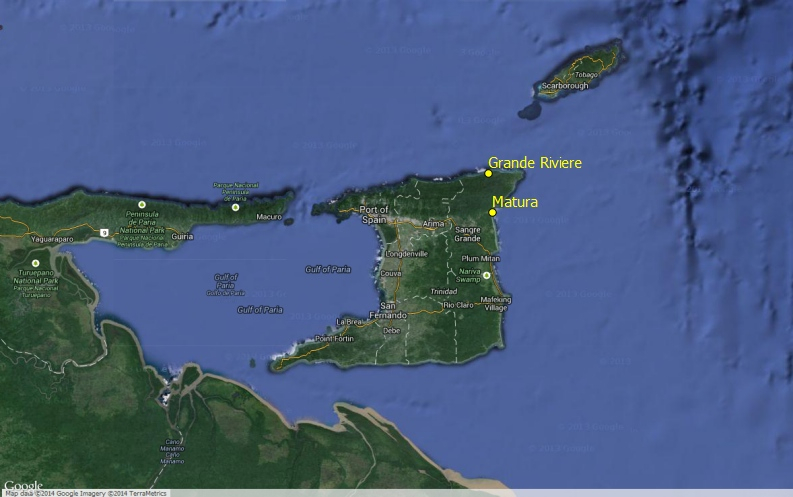 (We will meet up with our friends up at Grande Rivière later in the week.) And very soon, when it starts to get dark, we will head to the beach to see the nesting leatherback turtles. We’re searching for “Canadian” leatherbacks. If we find them, we will satellite tag two of them and hopefully get the first complete track of a Canadian leatherback turtle from the nesting beach to the waters off Atlantic Canada. We tried to do this with Peggy the turtle last year, but she was caught in fishing gear within a few weeks, and didn’t make it north. It’s been a long, long time since I’ve seen a nesting leatherback turtle. I’m a little nervous, like you feel before you meet a friend you haven’t seen in years. Everyone is getting ready around me. Scott just appeared in the hall dressed in field gear, carrying his giant blue backpack. Mike and Devan are across the way doing yet one-more-check over the scientific equipment we need tonight in case we put out a tag. The film crew is already at the beach. I need to turn on the light to finish this post, so the sun is almost down. Turtle time! I keep thinking about an article we posted on Facebook this week about a leatherback turtle that crashed a wedding in St. Croix. You can see the photos here. The guests were mingling on the beach and the leatherback emerged from the surf. She hauled herself up the sand and proceeded to lay a nest of eggs—a process that can take almost two hours. I bet that no matter how many years pass, the people who went to that wedding will never forget it. And every one of them will remember and talk about the leatherback. That turtle made an already meaningful event extraordinary. It’s one of the great gifts sea turtles give us. They arrest our view. They help us look for a moment not at ourselves, but at the miracle of a species that has remained virtually the same for more than 100 million years. By their simple presence, they offer us the chance to be amazed by our intricate, multifarious world. And that is something to celebrate. So Happy World Turtle Day to all of you! Margaret (in front) and (from left to right) Sheldon Murray, Kevin Muhammad, Trishara Hernandez, Latresa Mayers and Ria Steward– our friends in Trinidad from the Grande Rivière Nature Tour Guide Association and Stakeholders Against Destruction. Photo courtesy of Kevin Muhammad. “I was on the beach last night facilitating a tag training session with Toco folks and look who I ran into,” wrote Kevin Muhammad. She was back nesting again (likely for the third time by this point) and she looked terrific. This is a photo of the team that found her along with Margaret herself. It’s been an exciting few weeks at the beaches in Trinidad. On Matura beach, the Nature Seekers found seven Canadian turtles nesting! They could tell they were “our” turtles by reading their flipper tags. Flipper tags are small metal tags that sea turtle researchers attach to turtles’ flippers as a way of identifying the animals. The tags have a code made up of numbers and letters on one side (ours start with CAN for “Canada”) and the research group’s mailing address on the other. 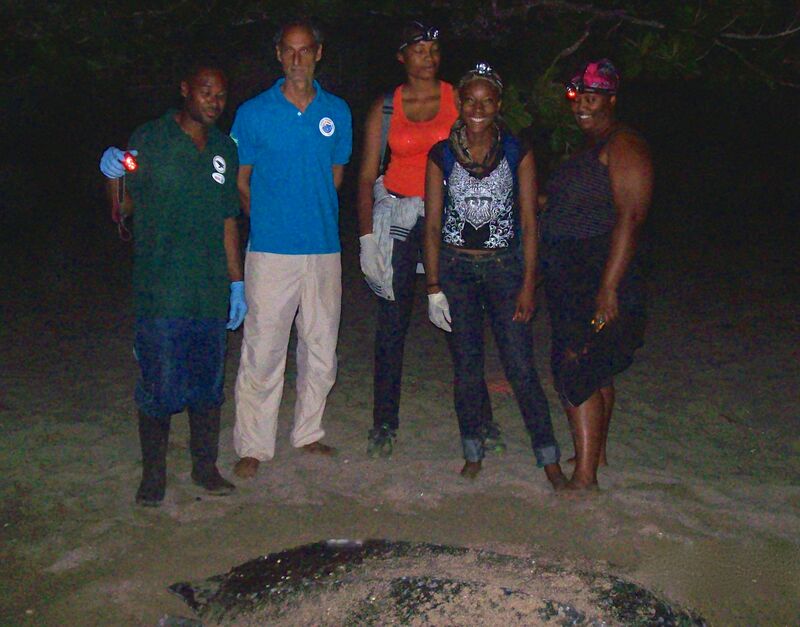 We flipper tagged one of the leatherbacks in 2011. Two of the turtles were previously satellite tagged. One of them in 2005 and the other in 2012. We are particularly excited to hear news of the turtle from 2012. She had been entangled in fishing gear when we found her. We cleared her of the gear before we put the tag on her and were interested to watch how she managed after the entanglement. We are thrilled to hear that she is healthy and nesting now!